That could mean a Valentines, Anniversary, Wedding or even a creation with hearts! Anything you like as long as it follows the theme. 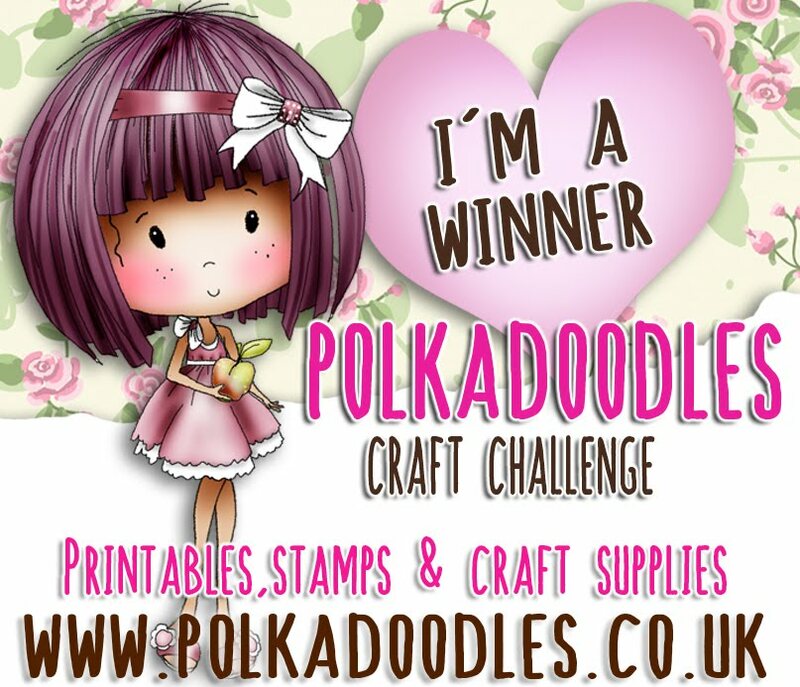 You have until Noon GMT, Friday 12 February to enter and our Random winner for this challenge will receive a $10 voucher to the Polkadoodles download store. 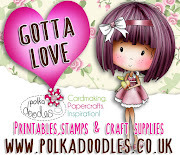 Before we have a look at the Design Team creations don't forget to take a look at the newest Polkadoodles Releases! Look at this baby - just released today!! Whoop whoop!! This is adorable and not just a Love collection either, this can be used all year round! Soooo many pretties to play with in this collection! EEEK!! Too too cute! Did you know that you can buy single digis, different bundles and of course thecuteosaurus whole mammoth bundle! Why not check out the store now! Melanie Smith - I have used Work & Play 9 - Love & Kisses. I choose this image because it reminded me of my husband and I :-) It was such fun to color. Jessie - Who says we can't love our pets, even if that pet is a dinosaur! 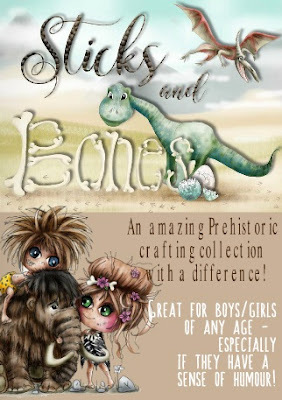 I used Walk the Dinosaur Girl from the new Sticks & Bones Collection in Digital and CD form! I coloured her and her best friend up with my copic markers, all of the paper's and embellishments (aside from the twine) all come from this collections, its seriously a fantastic TON of product to work with and I can't wait to see what you do with it, and with this weeks challenge! Ria- I think this Cupid from the Work and Play 9 Love and Kisses is my all time favourite from this collection. I coloured her with watercolouring pencils. 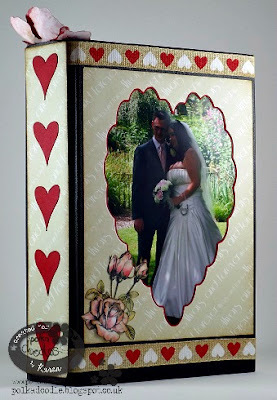 Jenny -I have used the Work and Play 9 Collection - Love and Kisses, I love this collection and after all this time just got around to doing one of the Rocker Cards, these are in PDF format and you just print. cut out and use whatever bits you need. 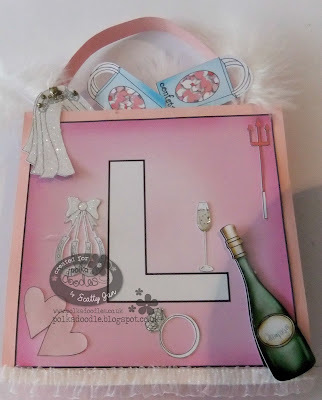 I have been out of the house so much that crafting has been just what I can fit in so these kind of designs that are ready to go are perfect for such times. 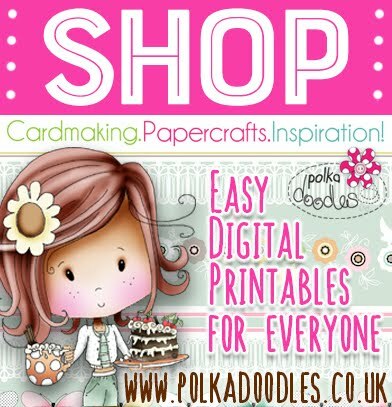 Jackie- I have been busy cutting out heaps of the gorgeous images from the new Sticks and Bones collection available here. I love how it is something different for a loved one. 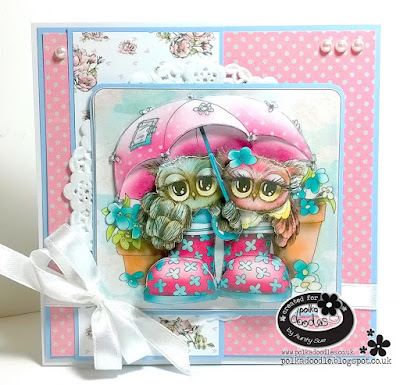 I chose to make a stepper card this week and coloured in the main image. Don't forget that the images are available pre coloured if you prefer. The papers and sentiment are also from the collection. 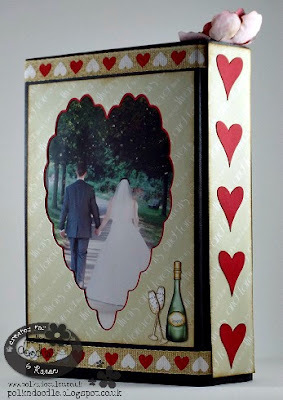 Mia - I have used the gorgeous Work & Play 9 - Love & Kisses Collection to make this cute Valentines card. The images and papers are perfect for any romantic card and it was so hard to choose between them. I loved colouring in these couple especially the girls hair for more details come and visit my blog. Fabulous inspiration once again from the team. We love coming to visit you all, so lets see what you create for this challenge. and our winner of the Winter Birthday challenge. Happy Friday everyone! Wow can you believe we are approaching the end of January already! The winners of our Anything Goes Challenge will be announced at the end of this post. Have a fabulous Birthday Nikky! whole Sticks & Stones collection to be had in the store! on this awesome collection until 29th January! at the checkout on both CD's and downloads in this collection! 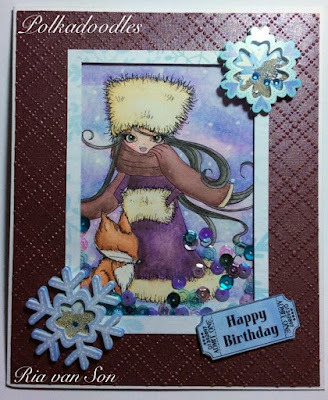 Ria- For the winter birthday challenge I created a shakercard, I used one of my favourite stamps from the Octavia Frosted Winter Collections , this is Frosted Fox and coloured it with watercolourpencils. 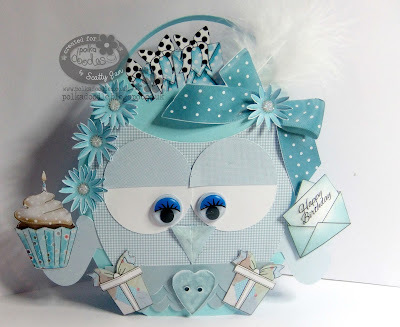 Scatty Jan - For my make for this challenge I went with winter colours of Blue, and made a cute owl bag perfect for a Birthday. I used the template from Twiggy and Toots Festive Fun , and re-sized to 65% before cutting out. ( I used pale blue card stock to make the bag shell.) I used some papers from the same collection and also some from Picknix 3 Nordic Winter. What a mix and match I just love using all different elements from the collections. Jenny - Here's my idea for a winter birthday, I always think of blue and purple tones for winter. This card is made using Oddella Twig which I coloured with my Graph'its, the backing paper is from Octavia Frosted Winter and the sentiment comes from Work and Play 6, more details on my blog. Melanie - I have done a hybrid project with the wonderful Work & Play 9 - Love and Kisses. 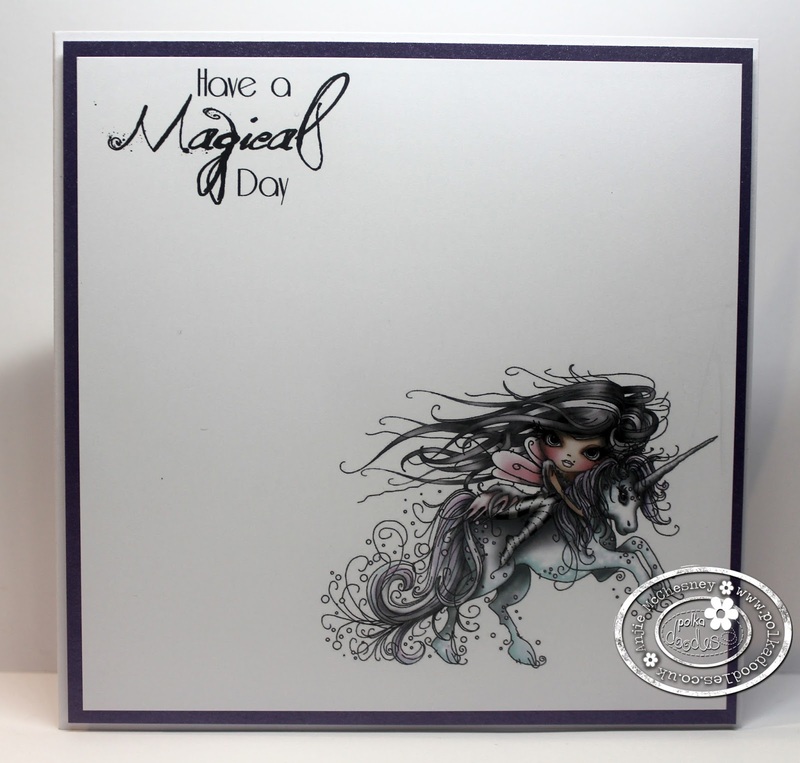 This printed image from the CD was a beautiful match to my designer papers and the bling I added to her tiara just fit for a princess birthday card. Jessie - Octavia has always been one of my favorite characters! And Frosted Penguins from the Octavia Frosted winter is no exception! 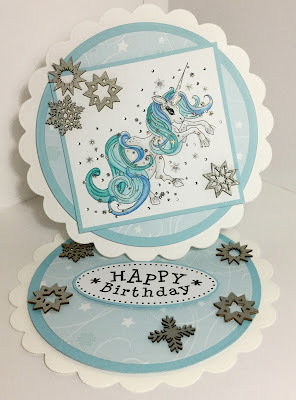 I wanted to colour her in pinky purples and blue so I pulled papers from the Octavia Moonfly Collection which still made for a fantastic winter birthday card! She was painted with my inktense pencils. Aunty Sue - Hi for my Winter Birthday I didn't want to go down the Blues colour theme, so went with a nice warm Red and the Blues with my background paper from Octavia Frosted Winter collection. The Tree is also from this collection in the shop HERE. The Cute girl is from Our Love and Kisses collection which you can find HERE you can purchase the image on its own also. But do checkout this collection with Valentines just around the corner. 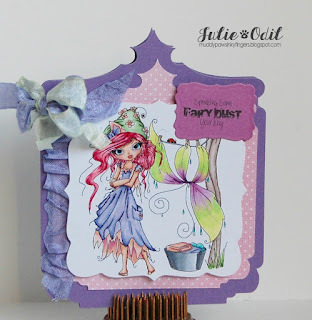 Jackie - I have used the gorgeous Work and Play10- Country Life collection for this week's card. The papers, image and sentiment are all found in it.The fox image on it's own is available here as a digi stamp to colour. I used lots of die cuts to create a white winter effect for the current challenge theme. Details on my blog. Congratulations everyone and don't forget your blinkies form the side bar. We loved everyones amazing creations and enjoyed visiting your blogs. See you next week - don't forget to use that great code for the new collection! Julie -- This is Winston, and he's celebrating! Why? His birthday is in January, and we're having this Winter birthday Challenge with him in mind! The Full CD collection can be found here. The Digital Craft download can be found here. The pre-printed image, sentiment tag, and Kraft paper are from the Winston Deluxe collection. 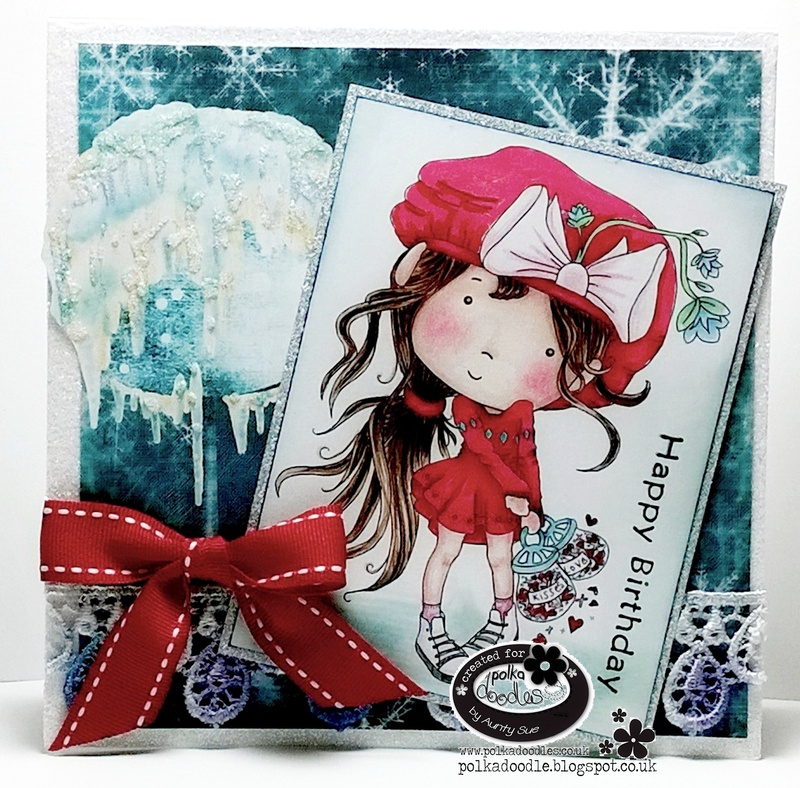 The Wintery blue designer paper is from the Frosted Winter Octavia Collection (digital download) or CD. Ruth: Perfect for an avid Blackburn Rovers fan who has just turned 10! Papers and pre coloured digi image taken from Work and Play Vol 6. I resized the papers to print A5 size and used my own number templates. I printed the pre-coloured image to save time. 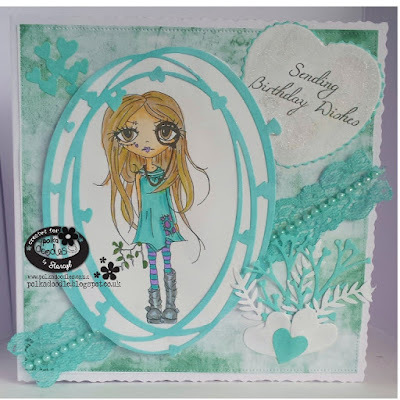 Caz -For my winter birthday creation i have made a shadow box card..Using the gorgeous Octavia-Winter Time...This digi is also available in the Frosted Winter-Octavia collection. Either on Cd, or if you prefer as a Download. 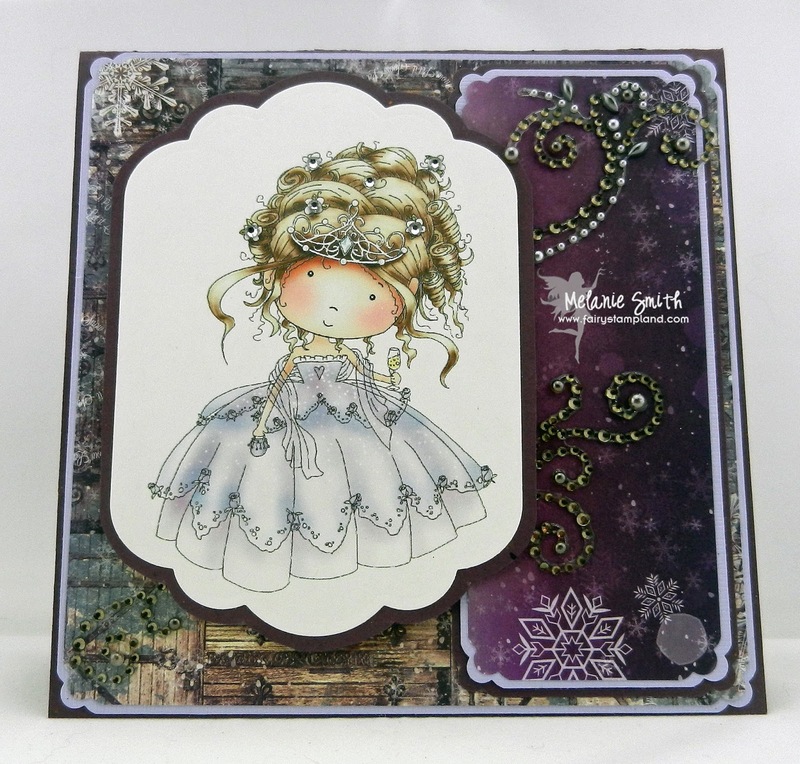 Background is from the fab Twiggy n Toots Festive Fun.. More detail on my blog. 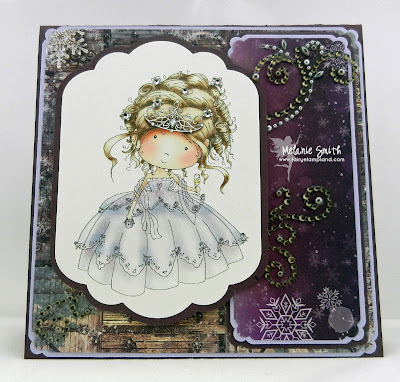 Anjie - I've changed the colours of some of the papers and embellishments from the Octavia Frosted Winter collection in the My Craft Studio program to dark winter colours. 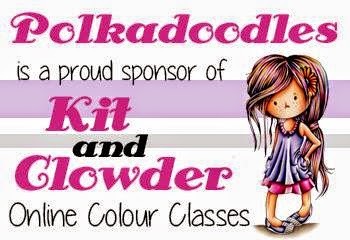 I then coloured the fab Oddella Bow image in with my Graph'It Markers to match the papers and embellies. 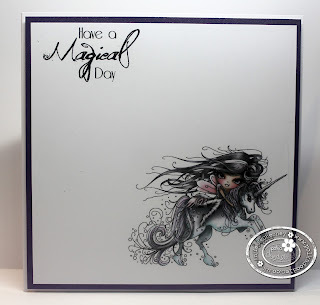 I used the same markers to colour a white piece of card to use as a mat behind the image. I raised the embellies onto 3D foam. Just look how real the bow looks and it's card! Then I cut a sentiment and again coloured it to match. 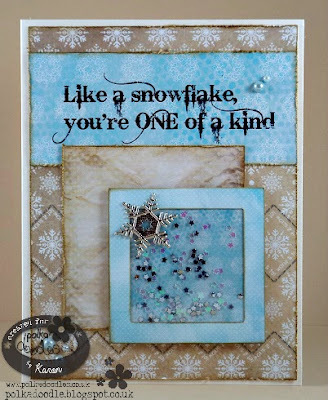 Finally I added some glitter to the foliage die and flower embellie to make it look like frost. Lou: I decided to make a winter birthday present using a cool colour palate. I have used Twiggy and Toots Festive Fun papers and the owl bag template (which I have tweaked). A small tutorial of how I did it, is on my blog. 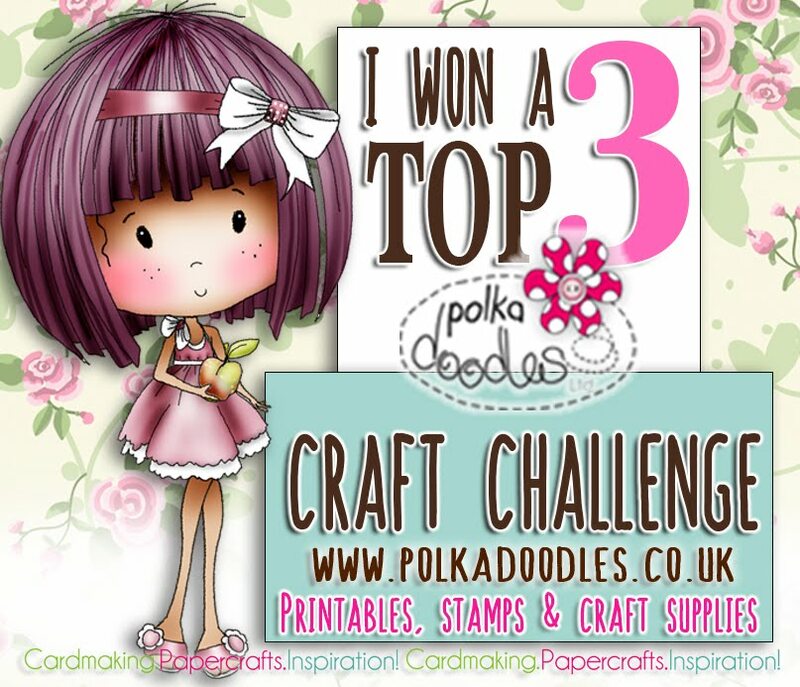 As a special for Christmas/New Year we will choose TWO WINNERS for this challenge who will both receive a $20 voucher for downloads in the Polkadoodles Store! Ruth: I've made another gift card wallet this week but used papers from Twiggy and Toots Festive Fun. Again, no actual template used - just made it up as I went along! 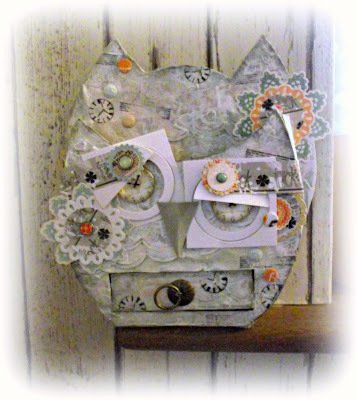 I've recycled a thick kraft envelope as my base and then added papers from the cd plus the sentiment. Quick and easy! 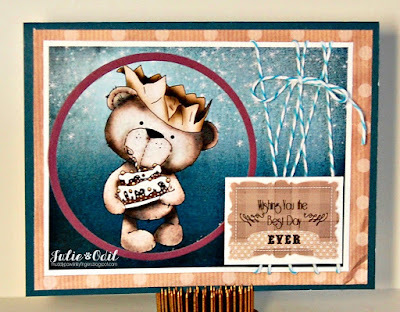 Bev here with an easel card made using the fabulous Twiggy & Toots collection. Due to being poorly over the holiday I used one of the design sheets to make a quick card. Anjie - I have used a pre-coloured image and sentiment from the Octavia Moonfly download collection to create a CAS card. You can also buy this collection as a CD should you wish to do so. Julie -- I've been wanting to color up this image for a long time, and the Anything Goes Challenge gave me the perfect chance. This is Octavia Moonfly, Washing Day. You can get the full collection here in CD or digital download. 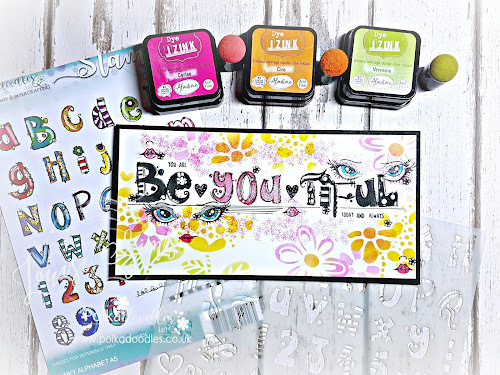 The designer paper and sentiment are from the same collection. The card shape, also from Polkadoodles, is Elegant Card 3.